You won’t go wrong when you purchase these outstanding films. The ChucksConnection list of the best films where at least one of the main characters wears chucks (Converse "Chuck Taylor" All Stars). The ChucksConnection list of films with the best chucks footage. Click here to see The ChucksConnection honor roll of actors who wear chucks in more than one film. The ChucksConnection complete list of films. Amelie. (2001) [R] Amelie, a shy young waitress in Paris, decides to help people around her, and along the way discovers love. One of the clever mysteries of this French film: who is the stranger wearing red high top chucks? Animal House. (1978) [R] Probably the best fraternity comedy ever made with a classic comedy performance by John Belushi. It’s too bad that the sexual subplot between college professor Donald Sutherland and student Karen Allen gives the film an "R" rating. Anya’s Bell. (1999) [Not rated, would be PG] It’s 1949. Anya, a blind woman who collects bells and never leaves her house suddenly finds herself alone when her mother dies. She meets Scott, another loner, a twelve-year-old boy from a single parent family who others term as slow, and they become friends. Together they help each other conquer personal handicaps. Too bad this film is only available through streaming. Back to the Future. (1985) [PG] The first and the best of the many time travel comedy/adventures that became popular as a result of this film. The skateboarding scene with Michael J. Fox is not to be missed. Before Midnight. (2013) [R] In this fourth movie of the Before Sunrise series, Jesse and Celine are vacationing with their family in Greece, at the beautiful estate of a Greek author. Jesse is 41, a successful author, but worried that he is not spending enough time with his son, Henry (from a prior marriage). Celine is the mother of their twin daughters, but not always happy about it, and is contemplating a job change. Are Jesse and Celine in the best years of their lives or in a middle aged crisis? Before Sunrise. (1995) [R, should be PG-13] A love story about two strangers — a young American writer on the rebound from a broken romance and a beautiful French graduate student — who meet on a train to Vienna, hit it off, and embark on a romantic adventure for one night, knowing that they may never see each other again. Bill & Ted’s Excellent Adventure. (1989) [PG] This comedy/adventure in the tradition of Back to the Future poses the interesting question "What if the survival of the world depended on the academic success of two teenaged valley guys from Southern California?" While this may sound frightening, the film is actually a campy sendoff of both history and modern society suitable for the entire family. The Black Stallion Returns. (1983) [PG] The extraordinary relationship between a boy and a champion Arabian horse is explored again in this sequel. The well-photographed adventure focuses on the boy’s courage and determination to track down and find the black horse when it is forcibly taken back to northern Africa by the Berber tribe. Boyhood. (2014) [R] Boyhood is a fascinating story of growing up as seen through the eyes of Mason Evans, Jr. (Ellar Coltrane). Mason literally grows up on screen before our eyes, along with Linklater’s daughter Lorelei, who plays Mason’s sister, Samantha. Linklater’s realistic script shows how Mason and Sam react to divorces, moves, road trips, family celebrations, the onset of adolescence, and constantly changing family members. Brainscan. (1994) [R] An under-rated science fiction thriller that explores the mindset of a teenager obsessed by computer games and horror movies. Breaking Away. (1979) [PG] A young champion bicyclist living in a college town wants to spend the year after high school just hanging around, competing in races, and having fun with his three best friends. But reality soon changes their lives in this Academy Award winning coming of age film. Back to Alphabetical Links. Bridge to Terabithia. (2007) [PG] Jesse Aarons is a 12-year-old artistically talented boy living in rural West Virginia who has been having a tough time due to money problems at home, lack of acceptance from his family, and fending off bullies at school. But life changes for the better when Leslie Burke, an adventurous and free-thinking girl his age moves in across the road. She encourages him to be imaginative and together they create the world of Terabithia in the woods near their homes. Charlotte’s Web. (2006) [G] Excellent adaption of the classic E.B. White tale about a young girl who adopts Wilbur, the runt of a litter pigs, the spider who helps him to survive, and how their actions end up affecting an entire Maine farm community. Chasing Ghosts. (2015) [PG] Eleven-year-old Lucas Simons and his parents are trying to deal with the death of Lucas’ older brother, who was Lucas’ partner in making videos. Things turn around in Lucas’ life when he meets Chris, a local author and basketball coach who had a near death experience. The Client. (1994) [PG-13] Susan Sarandon, Tommy Lee Jones, and Brad Renfro all deliver strong performances in this well done screen adaptation of the John Grisham novel about a young boy pursued by both the Mafia and the FBI when he witnesses the suicide of a mob lawyer. The Climb. (1997) [PG-13] A twelve year old boy wants to climb a huge but decrepit radio tower to prove his courage in this coming of age story set in suburban Baltimore in the late fifties. John Hurt plays a dying cranky old man living next door who helps the boy pursue his dream and discover the true meaning of bravery. The Cure. (1995) [PG-13] A moving coming of age story about two lonely eleven-year old boys who develop an unlikely friendship. This is an unusual film about kids because its strong character development, minimalist style, and the riveting performances by Brad Renfro and Joseph Mazzello more than compensate for the somewhat improbable story line. Back to Alphabetical Links. Duma. (2005) [PG] An orphaned cheetah becomes the best friend and pet of Xan, a young boy living in South Africa. When family circumstances change, Xan undertakes a trek to return Duma to his natural habitat. Back to Alphabetical Links. EDtv. (1999) [PG-13] An average guy working in a video store suddenly becomes a national celebrity when he wins a contest and a cable company begins broadcasting his life to the world 24 hours a day, affecting his relationships with family and friends. A great ensemble cast makes this bittersweet comedy work. Eternal Sunshine of the Spotless Mind. (2004) [R] An offbeat couple undergo a procedure to erase each other from their memories when their relationship turns sour. This very creative screenplay won an Oscar for Best Original Screenplay in 2005. Back to Alphabetical Links. The Fast and the Furious. (2001) [PG-13] Spectacular racing scenes highlight this story about a Los Angeles police detective who infiltrates a street racing gang to apprehend the drivers who have been hijacking cargo trucks. The Fault in Our Stars. (2014) [PG-13] Two teens, both who have different cancer conditions and their own unique takes at life, fall in love after meeting at a cancer support group. Great perforamnces by Shaline Woodley and Ansel Elgort elevate this film. Fire with Fire. (1986) [PG-13] A love story about two teenagers from very different worlds -- an honor prison camp and a Catholic boarding school -- who fall in love at first sight and risk everything to be together. Frailty. (2001) [R] A man confessers to an FBI agent about how his religious fanatic father’s visions led the family to participate in a series of murders to destroy "demons" on earth. Frequency. (2000) [PG-13] When a young Brooklyn policeman gets out his father’s old ham radio set on a whim during a storm, he soon finds himself talking with his father, who has been dead for thirty years! This breach of the space-time continuum soon leads to the two men trying to change the past and the surprising results that their tampering causes. This engaging thriller is both science fiction and crime drama, as well as a tribute to working class family devotion. Back to Alphabetical Links. Getting to Know You. (1999) [NR, probably would be R] Heather Matarazzo, Zach Braff, Michael Weston, Bebe Neuwirth, Mark Blum, Bo Hopkins. Written and directed by Lisanne Skyler. Judith, a shy teenaged girl about to enter a foster home and her older brother who is going off to college are stuck waiting at a bus station for five hours. They end up examining their loyalty to each other, their family troubles, and their true feelings about what is important in life after she meets street-smart Jimmy, who passes the time by telling her the life stories of various people they see in the waiting room. Based on several short stories by Joyce Carol Oates. Glasskår, aka Scars. (2002) [NR] Viktor Hansen, a perceptive thirteen-year-old, knows something’s up in his family. His parents are not talking to him, while his older brother OK tells him secrets he finds hard to believe. In the meantime Viktor is going through the normal rites of adolescence with his buddies Arnor and Roger. Filmed in Norwegian with English subtitles. Gleaming the Cube. (1989) [PG-13] Christian Slater plays a skateboarder whose life is radically changed when his stepbrother is mysteriously killed, and he is determined to find out why. The Glory Road. (2006) [PG] In 1966, Texas Western coach Don Haskins led the first all-black starting line-up for a college basketball team to the NCAA national championship. This is a film about winning and race relations in the 1960s. Gran Torino. (2009) [R] Clint Eastwood delivers one of his career best performances as Walt Kowalsky, an embittered old man estranged from his family and church, mourning the loss of his wife and in failing health. When Thao, a teenaged neighbor, is forced by a gang to try to and steal his prized 1972 Gran Torino, Kowalsky ends up reforming the teen and helping his Hmung neighbors rid the neighborhood of the gang. Grease. (1978) [PG] This Hollywood remake of the popular Broadway musical features fifties rock and roll music augmented by music from the BeeGees, a strong cast headed by John Travolta, lots of cameo performances to be appreciated by baby boomers, and of course lots of black high top chucks. Back to Alphabetical Links. Harry Potter and the Order of the Phoenix. (2007) [PG-13] Daniel Radcliff in his starring role as Harry Potter brings the series into the modern era by sporting a pair of black low cut chucks in this film and the following film, Harry Potter and the Half Blood Prince. With their warning about Lord Voldemort’s return scoffed at, Harry and Dumbledore are targeted by the Wizard authorities as an authoritarian bureaucrat slowly seizes power at Hogwarts. A History of Violence. (2005) [R] A small town family is thrust into the spotlight after Tom Stahl, the father, is declared a hero in the media after taking out two thugs trying to rob and kill the employees at his diner. Later when some mobsters from Philadelphia appear at the diner and say they know Tom under another name, his family and the sheriff begin to wonder if Tom is really who he says he is. 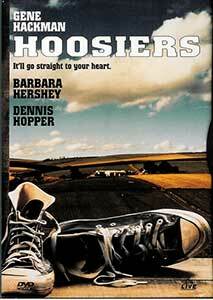 Hoosiers. (1987) [PG] This classic story of a small town basketball team that comes from nowhere to the state finals is considered by some critics to be the best sports film ever made. This film is worth a look just to return to the days when teams were defined by their black or white Chuck Taylor high tops. Back to Alphabetical Links. I, Robot. (2004) [PG-13] Will Smith plays a chucks-wearing technophobic cop investigating a crime that may have been perpetrated by a robot, a violation of the first law of robotics in this film based on the classic Isaac Asimov novel. Igby Goes Down. (2002) [R] An adolescent who has grown up in a dysfunctional, wealthy family tries to strike out on his own and find meaningful relationships, but must continually deal with the machinations of his mother, stepfather, and older brother, and the legacy of his mentally ill father. I.Q. (1994) [PG] A witty romantic comedy about a young auto repairman who comes up with a theory of quantum physics to impress his would-be girl, the daughter of Albert Einstein. Walter Matthau steals the show with his portrayal of Einstein. It. (1990) [NR-would be PG-13] A malevolent predatory force in a 1960s New England town takes on the shape of a clown to prey on young kids, until a group of seven 12-year-olds band together to stop it. When the force reappears 30 years later, the seven must re-confront the terrors of their youth to make a last stand against "It". Back to Alphabetical Links. Journey. (1996) [PG] Jason Robards and Max Pomeranc (Journey) are outstanding in this story of a restless mom who deserts her children and leaves them to be raised by their grandparents on the family farm. Through his love of photography, the grandfather helps Journey recover from the confusion and emptiness that he is experiencing, and discover the true meaning of what a family is. Just Looking. (1999) [R] In the summer of 1955 a 14 year old kid from the Bronx sets himself one goal: to see two adults making love. When his mother sends him to stay with his pregnant aunt and uncle in Queens, he thinks his plan is doomed, until he meets his gorgeous adult neighbor Hedy and hooks up with some like-minded kids in the neighborhood. Lady in White. (1988) [PG-13] A ghost story set in a small northeastern town pits a boy with dreams of becoming a mystery writer against a serial killer when the boy sees an apparition re-enacting the ten year old unsolved murder of a young girl. Lost Christmas. (2011) [NR, would be PG] Orphaned the previous Christmas, a young boy looks after his demented grandma by selling stolen goods to a soft-hearted fence. One Christmas Eve the boy meets Anthony, an enigmatic stranger with apparent psychic powers, who begins to change his life. Back to Alphabetical Links. Matinee. (1993) [PG] John Goodman, Cathy Moriarty, Simon Fenton, Omri Katz, Lisa Jakub, Kellie Martin, Jesse Lee. Directed by Joe Dante. This tribute to grade B horror flicks stars Goodman as a fly-by-night producer promoting his newest film "Mant" (half man, half ant) in Key West, Florida during the same week as the Cuban missile crisis. Mr. Holland’s Opus. (1995) [PG] This film about the thirty year struggles of a music teacher to make ends meet, inspire his students to perform music at a high level, and deal with the pressure of raising a deaf son is an emotional tribute to the importance of arts education in our schools. A Monster Calls. (2016) [PG-13] Small for his age, young Conor feels very damaged, guilty and mostly angry when outside his inner world of drawing and imagination. He struggles at school with bullies, pity looks from everyone, and at home with his mother’s terminal sickness and the absence of his father until a huge yew tree monster helps him face the truth. Back to Alphabetical Links. My Girl. (1991) [PG] Vada Sultenfuss, an eleven year old with aspirations to become a writer learns about life (and death) when her widowed father, the town mortician, gets a new girl friend, and through summertime adventures with her best friend, a shy but intelligent boy living next door. My Girl 2. (1994) [PG] In this sequel, Vada travels to Los Angeles to try to find out about her long dead real mother and finds romance with the son of her uncle’s girl friend. Mystery Kids. (1999) [PG] Geneva Johnson, an aspiring 12-year-old mystery writer, and her best friend, Tommy, spend their summer searching for a missing girl in order to collect a $5,000 reward. The witty and well-delivered dialogue along with the great personal rapport of these junior sleuths combine to make this a gem of the mystery genre suitable for the whole family. Back to Alphabetical Links. A Perfect World. (1993) [PG-13] Butch Haynes escapes from prison with another inmate, and is on the run from the law, led by Texas Ranger Red Garnett, leading deputies and and a criminologist in a statewide pursuit. Butch takes a young boy as a hostage, but surprisingly the two end up bonding, with each enjoying the father-son relationship that they never had, while the law continues to hunt them down. The Pistol: The Birth of a Legend. (1991) [G] The story of how Pete Maravich began to pursue his dream to become one of the world’s greatest basketball players with the support and encouragement of his father, a visionary basketball coach at Clemson University. The film deals with young Pete’s early high shool years, when he was a freshman on the Daniel High School varsity team. Pie in the Sky. (1996) [R] A light hearted romance about a young man with two obsessions -- understanding traffic patterns and pursuing Amy, the girl of his dreams. Back to Alphabetical Links. The Right Stuff. (1983) [PG] This film adaption of Tom Wolfe’s classic story of the Mercury astronauts shows how they and their families faced the unknown dangers of early rocket flight along with the overwhelming pressures of becoming instant celebrities. Rocky. (1976) [PG] Sylvester Stalone’s first boxing film stands up over time as one of the best sports films ever made. The training sequence where Rocky runs up the steps to the top of Philadelphia’s Art Museum square to the pulsating Rocky theme is a classic film moment. Run Lola Run. (1998) [R] Time is running out for Lola in this surrealistic thriller. She’s just received a frantic call from her boy friend, Manni, who has lost a small fortune belonging to his mobster boss. If Lola doesn’t replace the money in twenty minutes, Manni will surely suffer severe consequences. Running on Empty. (1988) [PG-13] Powerful performances by Christine Lahti, River Phoenix, Judd Hirsch, Martha Plimpton, and Steven Hill highlight the story of the Pope family, living in the underground on the run from the FBI since the late sixties. Now Danny, their oldest son and a talented pianist, wants a life of his own and the opportunity to study music at the Julliard School in New York, but this means a complete separation from his family or the paper trail required for admission will tip off the authorities. Back to Alphabetical Links. The Sandlot. (1993) [PG] A nostalgic look at a group of boys who spend every possible moment of their summer playing baseball. This film celebrates a simpler lifestyle for kids when all that was needed for a good time was a baseball glove and ball to throw, a pair of chucks to run around in, some friends to hang out with, and a sandlot where they could play the game. School of Life. (2003) [PG] A hip new teacher makes a big impact on the students and faculty of a middle school. The School of Rock. (2003) [PG] A wannabe rock star, kicked out of his own band, and in desperate need of cash, poses as a substitute teacher at an exclusive private elementary school. When he discovers that his students have musical talent, he turns the class into a rock group to compete in a local battle of the bands. Sin City. (2005) [R] A contemporary film-noir, with clever uses of spot color, based on the comic novellas writen and illustrated by director Frank Miller. Three intertwined storylines are about Marv, a brutal thug seeking the murderer of a beautiful woman who was killed while asleep in bed with him; Dwight, an ex-photographer who accidentally kills a corrupt hero cop and has to cover it up; and Hartigan, a police detective who is incarcerated for a crime he didn’t commit to protect a young victim. Sky High. (2005) [PG] Set in a world where superheroes are commonly known and accepted, young Will, the son of Commander Stronghold and Josie Jetstream, tries to find a balance between being a normal teenager and the expectations that he will be another superhero. Sling Blade. (1996) [R] An unconventional character study written, directed, and starring Billy Bob Thornton about a seemingly retarded man recently released from a mental hospital after years of incarceration for murdering his mother and her lover when he was nine. The main story line is based around the friendship that Thornton develops with a young boy, and the boy’s widowed mother as the tragedy of his own life is gradually revealed. Back to Alphabetical Links. Sneakers. (1992) [PG-13] A renegade team of computer hackers are blackmailed into carrying out a covert operation against a industrialist who has developed the ultimate computer weapon -- a black box that is capable of breaking into any computer system in the world. A great ensemble cast led by Robert Redford and Sidney Poitier. Stand and Deliver. (1988) [PG] Edward James Olmos’ tour-de-force as the uncompromising mathematics teacher in a ghetto high school who insists on teaching his students calculus. Stand By Me. (1986) [R, should be PG-13] A coming of age story about four twelve year olds living in a small town in the year 1959, whose lives were changed by a chance adventure to find the dead body of a missing boy that had been spotted in the woods twenty miles away. Starman. (1984) [PG] An alien whose space ship crash lands on earth takes the form of a young widow’s late husband and forces her to help him travel to Arizona where he can be reunited with his mother ship. At first she resists, but gradually as the alien develops more human traits reminding her of her husband, and she sees the hostile attempts by the government to capture the starman, she begins to actively help him. Super 8. (2011) [PG-13] During the summer of 1979, a group of friends shooting amateur video movies witness a train crash and investigate subsequent unexplained events in their small town. The Sure Thing. (1985) [PG-13] John Cusack plays a college freshman at an Eastern college full of hope for improving his love life. When his best friend back home in California tells him that he has set up a "sure thing" for him over Christmas break, he ends up riding back with a prim and proper coed also going to California. Back to Alphabetical Links. To Dance with the White Dog. (1993) [PG] After fifty years of marriage, Sam Peek loses his beloved wife, Cora, and no amount of fussing by his overprotective children is going to ease Sam’s loneliness or failing health until one day a beautiful white appears out of nowhere and brings positive change to his life. The only problem-- no one else can see it except his grandson, Bobby. Twins. (1988) [PG] This comedy/adventure successfully pairs the unlikely combination of Arnold Schwarzenegger and Danny De Vito as two twin brothers who were created as part of a genetics experiment gone awry. After the two meet up, they end up going on the road, with Schwarzenegger on a mission to find their real mother and DeVito trying achieve a windfall from a stolen rocket he has gotten hold of by accident. Back to Alphabetical Links. Wayne’s World. (1992) [PG-13] The first of two feature films based on the popular Saturday Night Live comedy segment about two young guys into the heavy metal scene who broadcast a weekly program on the Aurora, Illinois public access channel. Funny situations, creative dialogue, and Mike Meyer’s self-deprecating approach to the project make this film work. Ways To Live Forever. (2010) Sam, a twelve-year-old boy suffering from leukemia wants to know everything he can about life, his disease, and death, a possibility he might face. Together with his best friend, Felix, he embarks on a "scientific investigation" and a bucket list of things to do and find out. West Side Story. (1961) NR (probably PG-13) This film version of the trend setting Broadway musical about two rival gangs in Manhattan’s Hell’s Kitchen influenced a generation and won numerous Academy Awards. This modern day Romeo and Juliet remake has a fabulous musical score by Leonard Bernstein with lyrics by Stephen Sondheim, impressive choreography by Jerome Robbins, and strong performances by the principal actors. Chucks have an important role in the costuming, with the Jets wearing white low cuts, and the Sharks wearing black low cuts. Back to Alphabetical Links. These films feature great chucks cinemaphotography. Except for The Cure and The Pistol: The Birth of a Legend, they are rated between two and three chucks. The Babysitters Club. (1995) [PG] Good chucks shots abound in this pleasant family comedy about Kristy, the leader of a group of seven girls who decide to run a summer camp for kids to earn money. But things are complicated by other kids and some adults, including her long-absent father who shows up and wants to spend time with her. The Basketball Diaries. (1995) [R] Leonardo di Caprio and his friends on a Catholic high school basketball team all wear black high top chucks on the road to lives of drug addiction and crime. Charlie Bartlett. (2007) [R] Expelled from a series of private schools, wealthy and intelligent teenager Charlie Bartlett must attend a public high school where he at first has trouble fitting in and is harassed by school bully Murphy Bivens until he begins to better understand the social structure at the school. Part of Charlie’s character is the wearing of black high top chucks even with fancy dress clothing. Child’s Play 2. (1990) [R] This is the second film in the series about the evil doll Chucky who is trying to possess the soul of young Andy Barclay (Alex Vincent). There are some great chucks shots in the chase scenes between Vincent and the Chucky doll. The Cure. (1995) [PG-13] This film has outstanding chucks cinemaphotography, including two scenes where one of Brad Renfro’s black high tops serves as a symbol of the friendship that has developed between the two main characters. Diary of a Wimpy Kid (2010), Diary of a Wimpy Kid 2: Rodrick Rules (2011), Diary of a Wimpy Kid 3: Dog Days (2012). This series of films about the trials in the life of middle school kid Greg Hendley features terrific chucks cinemaphotography of his black high top chucks in all three films. Encino Man. (1992) [PG] Two Los Angeles high school losers dig up a frozen caveman in their backyard and when he thaws out they figure he is their ticket to being part of the "in" crowd at school. But the caveman turns out to be wilder and crazier than they ever imagined in this satire about the stone age meeting generation X. Ice Cream Man. (1995) [R] According to one of the actors, this cheesy horror film was sponsored in part by the Converse Company. There certainly is an underlying chucks theme, because nearly all of the main characters wear Chuck Taylor high tops in various colors, and there are lots of good shots of them throughout the film. The Paperboy. (1994) [R] Closeups of Marc Marut’s red high top chucks are used as a symbol of his psychotic and malevolent behavior in this unsettling horror film. The Pistol: The Birth of a Legend. (1991) [G] This film is about basketball star Pete Maravich’s early high shool years, when he was a freshman on the Daniel High School varsity team. Great chucks footage throughout, especially during the training sequences. The Skateboard Kid. (1993) [PG] Lots of great chucks shots in this fantasy about Zack, a teenaged skateboarder who moves from Los Angeles to a small town, where the local skaters treat him with hostility. When lightning strikes Zack’s skateboard, it becomes alive, turning into Rip, a wise cracking personality who becomes Zack’s confidant and helps him fight against the local skateboard gang who are continually trying to take him down. Thrashin’. (1986) [PG-13] A skateboarding tribute to West Side Story about a champion skateboarder who falls in love with the sister of the leader of a rival gang. Nearly all of the characters wear high top chucks, and there are lots of closeup shots during skateboarding sequences. Tommy Tricker and the Stamp Traveler. (1987) [Not Rated but would be G] This Canadian family classic with a stamp collecting theme is filled with great chucks shots. Ralph and Tommy, the two main characters, wear them during most of the film and chucks even appear on stamps when Ralph and Tommy go stamp traveling.